Kelly Clarkson is a well-known American singer, songwriter, actress and author. She became known to the people of the United States when she won the first season of ‘American Idol’. The win skyrocketed her to stardom as well as fetched her a multi-million contract with RCA Records and other labels. The singing prowess has bagged three Grammy Awards over the years, making her the best selling artist of our time. In addition to singing, Kelly has also appeared in a number of films and television series. 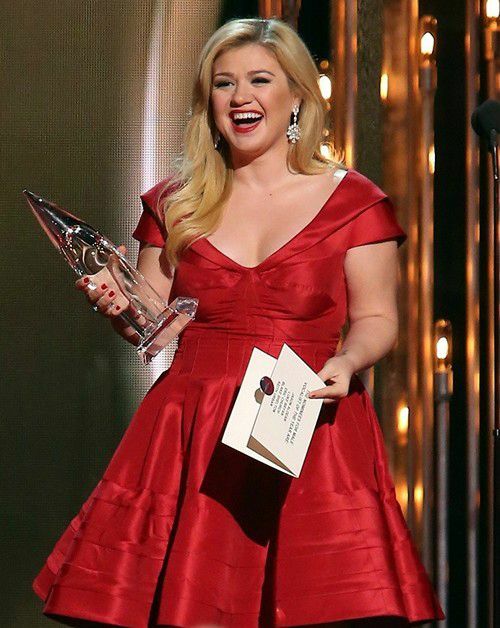 Check out everything you wanted to know about this singing sensation, Kelly Clarkson, including her childhood, acting career, personal life, family, height, weight, vital stats, achievements, net worth and fun facts. Kelly Clarkson was born on 24 April 1982, in Fort Worth, Texas, USA. Kelly went to Pauline Hughes Middle School and graduated from Burleson High School in Burleson, Texas. Kelly Clarkson married Brandon Blackstock on October 20, 2013 after dating for over a year. He is the son of her manager Narvel Blackstock. With the marriage, she became a stepmother to Blackstock’s daughter Savannah and son Seth from his last marriage. They both welcomed their first daughter named, River Rose Blackstock on June 12th, 2014 and son Remington Alexander Blackstock on April 12, 2016. Prior to her marriage, the talented singer was romantically linked with Ryan Key, Justin Guarini, and Graham Colton. She wears a size 12 (US) shoe. After winning the title of the inaugural season of the show; ‘American Idol’ in 2002, she was signed by RCA Records for a staggering deal. The same year, Kelly Clarkson released her debut double-A-side single, “Before Your Love”/”A Moment Like This”, which peaked at number 52 on Billboard Hot 100 chart. It eventually went on to become the best-selling single of 2002 in the United States. Kelly released her debut album, “Thankful” on April 15, 2003. The album comprises different music styles and went on to debut at number one on the ‘US Billboard 200’, while its lead single, “Miss Independent”, was a top ten hit in the US. She has released eight studio albums, four extended plays, one compilation album, one remix album, and 38 singles as of November 2017. The fame she obtained from the show earned her a role in 2002 gay-themed independent romantic drama film Issues 101. She rendered her voice to the character ‘Leah the horse’ in the 2017 American computer-animated Christian adventure comedy film, The Star. In fact, 2002 was a breakthrough year for Kelly Clarkson, which also landed her an extra role in Fox’s sitcom That ’80s Show in an episode titled “Valentine’s Day”. Thereafter, Kelly has appeared in a number of television shows and series like The Voice, Nashville, Saturday Night Live, to name a few. Kelly Clarkson has a net worth of $30 million US dollars as of 2017. That money comes from album sales, concert earnings, merchandise sales, endorsements, film and television appearances. Particularly, concert tours have added a great value to her net worth. She lives with her family in a plush Mansfield mansion located at Texan, which is valued at $1.5 million. This luxury house boasts four bedrooms, dual master suites, living room, dining area, office space, a modern kitchen and six bathrooms. Kelly is extremely popular on social media with over 12.2 million followers on Twitter, 13 million followers on Facebook and 2.7 million followers on Instagram. Kelly’s award credits include three Grammy Awards, twelve Billboard Music Awards, four American Music Awards, three MTV Video Music Awards, and two Academy of Country Music Awards. Clarkson has been influenced by musicians across various genres including Aerosmith, Aretha Franklin, Garbage, Etta James, Jimi Hendrix, Mariah Carey, Radiohead, and Whitney Houston. In 2012, she was included in the top 100 Greatest Women in Music. Prior to fame, she appeared as an extra in many television series. She received critical acclaim for her live performance of ‘My Country, ‘Tis of Thee’ at the second inauguration of the U.S. President Barack Obama in January 2013. She was ranked nineteenth on VH1’s list of 100 Greatest Women in Music. She replaced Miley Cyrus as the new coach on the 14th season of the American singing reality show, The Voice.